So, you are a wine enthusiast. Over the years you have gathered a fine collection of wines but you’re not happy with the current wine storage arrangements. Or maybe you’re just looking for a small wine cooler where you can chill a bottle or two before opening them. If you are searching for the right wine storage solution but you have a limited space or only a few bottles to preserve, the right appliance for you might be a countertop wine cooler. 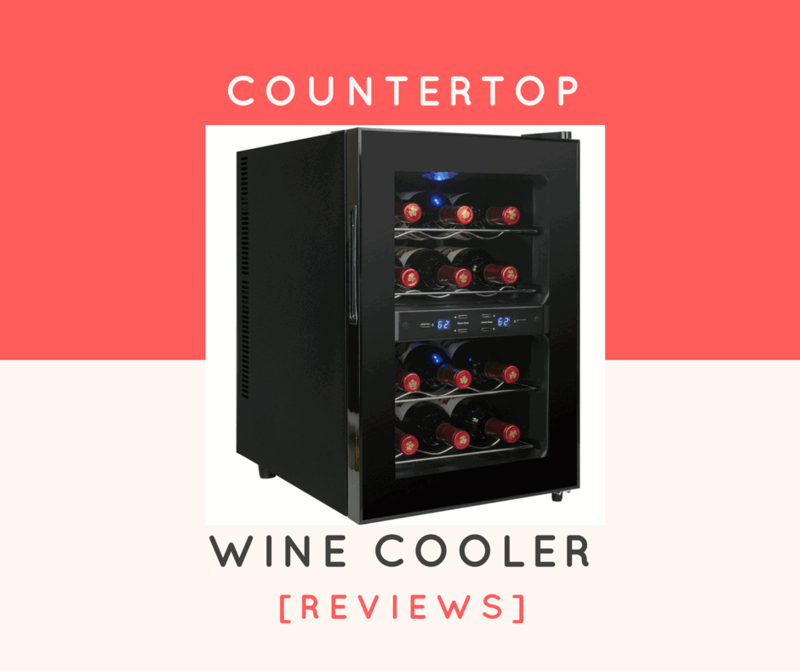 In this article, we are going to discuss in detail the features of the countertop wine coolers and provide a list of the most popular countertop wine cooler reviews, so you will be able to decide if these units are the best choice for you and which one to buy. Is A Countertop Wine Cooler Right For You? On the market, there are available different types of wine coolers. These units are designed to meet the needs of almost all wine enthusiasts who don’t have access to a cellar for the preservation of their wines. Based on the style and size, we can distinguish between three different types of wine coolers. These wine coolers are very similar to the regular refrigerators, the main difference between the two being that the wine coolers are designed specifically for wine. These units can vary in dimension from small wine coolers with capacities of 12 to 18 bottles to medium size and large wine coolers, the large models being suitable for collections of 100 bottles or more. These units can be compressor wine coolers or thermoelectric wine coolers. Depending on your needs and on the place where you plan to locate the unit, you should determine which is the right option for you. You will also be able to choose a unit with a dual zone temperature, ideal if you have a collection made of various types of wines. As the name suggests, these units are designed to be placed inside kitchen cabinets or integrated into the décor of the living room or home office as part of the furniture. Typically, these units have smaller capacities compared to the free-standing wine coolers, and are usually compressor units, although some manufacturers produce thermoelectric built-in wine coolers as well. Just as in the case of the freestanding units, you will be able to choose between models with single or dual temperature zones, based on your needs. The smallest models of wine coolers available on the market, these units are ideal if you only have to store a small collection of wines or if you have a limited space in your house. You can place these units anywhere you like, from the kitchen countertop to a cabinet shelf or on a table in the living room or home office. Many manufacturers use the thermoelectric technology for their countertop wine coolers, so these units are usually quiet. Although they are designed for small collections, the capacities of the countertop﻿﻿ ﻿﻿﻿﻿﻿wine cool﻿﻿ers usually vary from four to 24 bottles. One thing to keep in mind is that these wine coolers must be placed at a distance from the walls because they need proper ventilation in order to function well. If you want to integrate the cooler into a piece of furniture, choose a built-in model. The smallest models of the countertop wine coolers are almost exclusively single zone units, while the larger units can have dual temperature zones. Regardless of what type of wine cooler you need, there are a few things to consider before buying a wine cooler. Let's have a look at them. The first thing to consider before buying a wine cooler is the size you need. The size should be determined based on the available space you have, but also based on how large your wine collection is. If you have a limited space, then a built-in or a countertop wine cooler might be the best solution. When it comes to the capacity, one thing to consider is that the capacity advertised by the manufacturer refers, in almost all cases, to regular size 750 ml Bordeaux bottles. Considering what types of wine you have, you should determine if you need to rearrange the shelves configuration inside the cooler or if you need to buy a cooler with a larger capacity than the advertised one. If you begin your collection with only a couple of bottles but plan to increase it with the time, then you should probably consider buying﻿﻿ ﻿﻿a larger wine cooler from the first place. In fact, according to the experts’ opinion, the right capacity of a wine cooler, if you don’t know how large your collection will get, is of 40 bottles. Based on your intentions, you should determine what cooling system you need. The compressor wine coolers are noisy and emit a few vibrations, but they are ideal if you buy a wine cooler mainly for chilling your wine before serving. On the other hand, if you need a wine cooler to preserve your wine in good conditions, it is advisable to buy a thermoelectric wine cooler. These units are quiet and they have very low or zero level of vibrations, therefore they will not disturb the sediment in your wine. Most of the countertop wine cooler use the thermoelectric technology. In addition to the two important aspects described above, you should decide what other features you want in your wine cooler. While it is possible to buy a small countertop wine cooler at more than affordable prices, you shouldn’t save money on this purchase, especially if you want to preserve an expensive collection of wines. Our advice is to invest in quality and choose the most affordable wine cooler that has all the characteristics you need but that is reliable and durable. The best thing to do if you want to determine the quality of a unit is to consult our countertop wine cooler reviews. 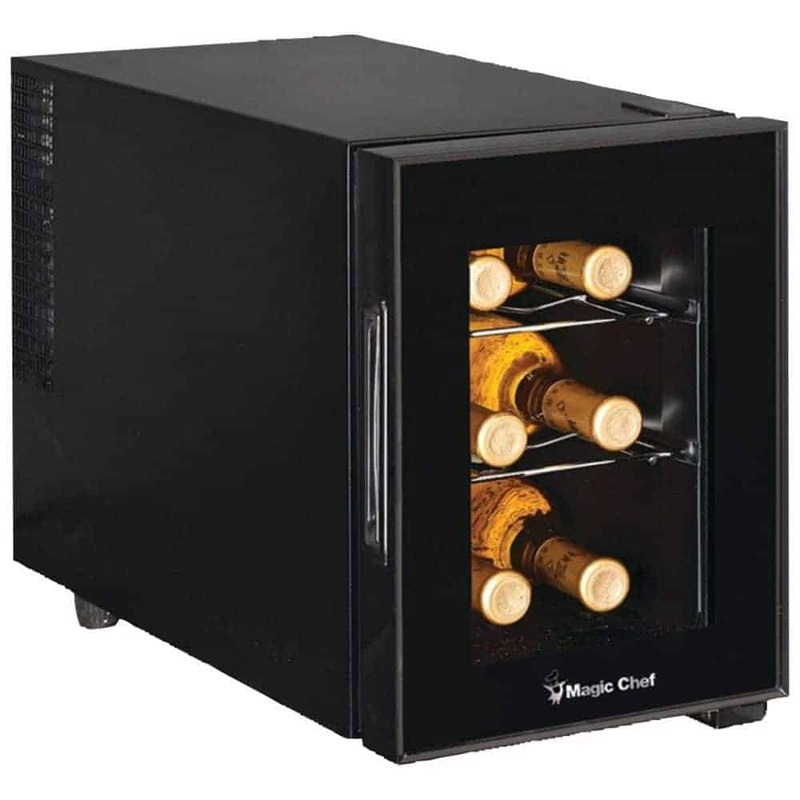 One of the most popular countertop wine coolers, with a capacity of six bottles, is this Magic Che﻿﻿f MCWC6B wine cooler. The unit has a sleek and compact design, the black cabinet fitting perfect in any décor. You can place this wine cooler in your kitchen or on a table in the living room or office. This wine cooler uses the thermoelectric cooling technology, having a quiet operation and a very low level of vibrations. This means that you can preserve in this unit even the finest wines without any problem. Removable chrome shelves: the unit is equipped with three chrome shelves that are removable, so if you have larger bottles you can easily change the internal configuration. Adjustable temperature: suitable for both white and red wines, this wine cooler has an adjustable temperature that ranges between 46 and 64 degrees Fahrenheit. Leveling legs: you can not only adjust the legs to the desired height, but you can place the wine cooler in the correct position even on uneven spots. Internal light: you will find this feature extremely useful especially if you want to admire or show your collection of wines without opening the door. The unit is not provided with a thermostat, so you will have to use a thermometer if you want to check the temperature. A very nice countertop wine cooler with a dual zone cooling feature is this AKDY® wine cooler that has a capacity of 12 bottles. 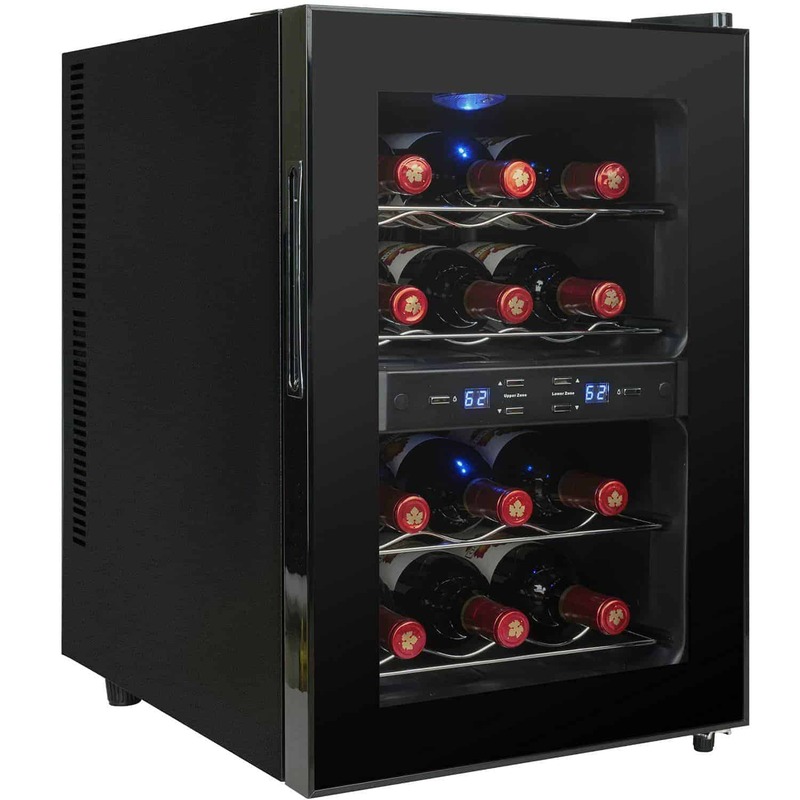 Ideal for the storage of both red and white wines, this wine cooler has an upper zone with temperatures that vary from 44 to 66 degrees Fahrenheit, while the lower zone has the same temperature range. The best part is that you can set the same temperature in the whole cooler or different temperatures in each zone. To keep your wine safe from the UV light, the wine cooler has a double panned dark glass door, while the thermoelectric technology will preserve the drink in the best conditions. Four removable shelves: both zones have a six-bottle capacity and two removable chrome shelves, so you can change the configuration to accommodate larger bottles. Internal light: the wine cooler has two soft blue internal lights that are controlled separately, one for the upper zone and one for the lower zone. Easy to control: setting and controlling the temperature is very easy thanks to the intuitive controls. Modern design: this unit can be placed anywhere in your home thanks to its beautiful modern design. Some users are not happy with the cooling capacities of this unit, but it shouldn’t be forgotten that this is a thermoelectric wine cooler designed especially for the preservation of wines and not for chilling them before serving. If you need a larger countertop wine cooler, then a unit to consider is this Whynter thermoelectric wine cooler designed to hold up to 20 standard-size bottles. This wine cooler also boasts a sleek and modern design, being easy to integrate it into any décor of your home. The unit has a single temperature zone and the adjustable temperature ranges from 46 to 65 degrees Fahrenheit. The soft interior LED lighting will allow you to admire your wine collection anytime you want, while the convenient on/off switch will allow you to turn off the light anytime you don’t need it. Five removable shelves: if you want to preserve larger bottles of wine, you should know that this unit comes with five stainless steel removable shelves. Black tinted glass door: to keep your wine safe from the action of the light, this unit has a black tinted mirror glass door. Digital control panel: setting the desired temperature is easy, thanks to the soft-touch digital control panel. Truly quiet operation: unlike many other thermoelectric units that are rather loud, this wine cooler has a truly quiet operation and it is completely free of any vibrations. Some customers complained about receiving this product with the internal glass door shattered, however, this is not necessarily caused by the poor quality of the unit but rather by the transport conditions. 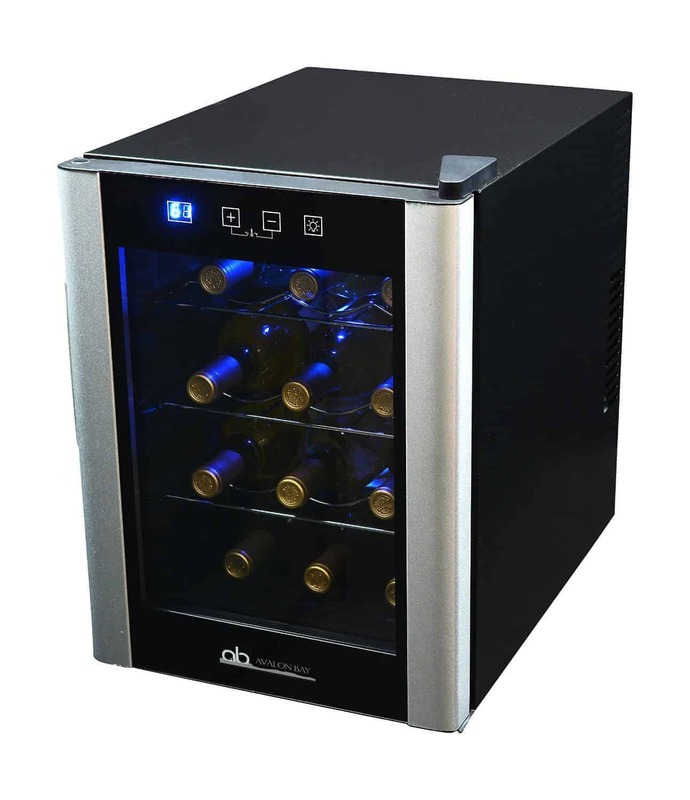 A countertop wine cooler that really impresses with its sleek design is this Avalon Bay 12 AB-WINE12S that has an elegant design and a capacity of 12 bottles. This unit is equipped with convenient digital controls and with a pleasant soft blue internal light, while the internal temperature can be adjusted between 51 and 64 degrees Fahrenheit. This wine cooler is equipped with three removable chrome shelves, so it will be pretty easy to change the internal configuration if needed. Using the thermoelectric technology, the unit is also very quiet and has an extremely low level of vibrations. Compact and portable: although this is a countertop wine cooler, the manufacturer equipped this unit with convenient wheels, just in case you want to place it on the floor or transport it around the house. Roomy: the advertised capacity is the true one, inside the cooler fitting perfectly twelve bottles of wine. Extremely silent: this wine cooler has a really silent operation. Basically, you will not hear it running. Beautiful details: the black design is enhanced by two stainless steel stripes on the sides of the door, which is very beautiful. This wine cooler is not able to reach the lowest temperature in most of the cases, so keep that in mind if you need less than 53 degrees Fahrenheit. The last countertop wine cooler reviewed is manufactured by Haier and has a capacity of twelve regular size bottles. 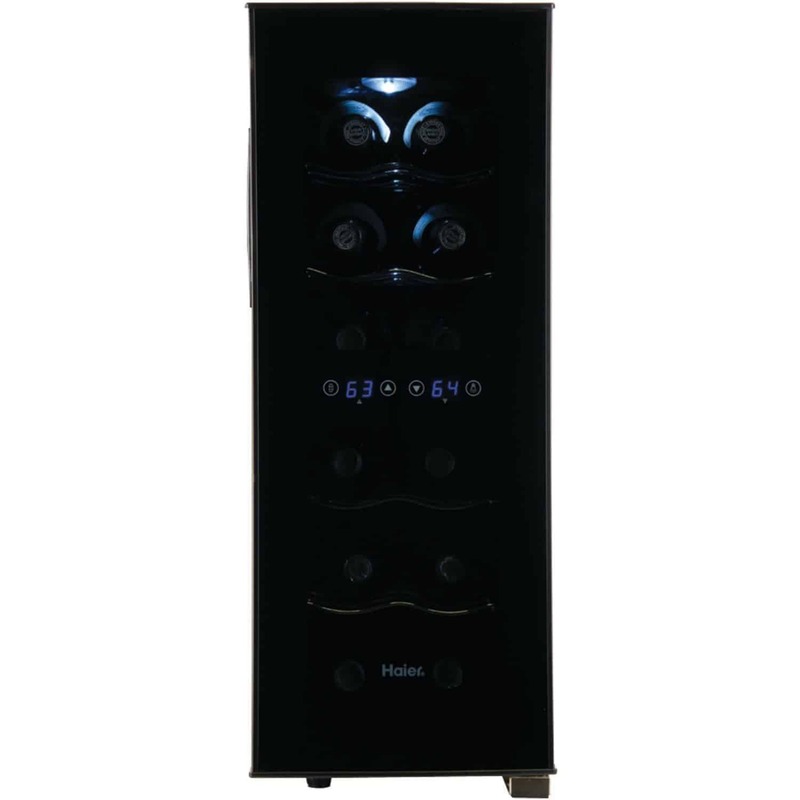 All the wine coolers from Haier impress with their elegance and this unit is no different. It has a sleek and stylish design, fitting easily in a classic or modern décor. 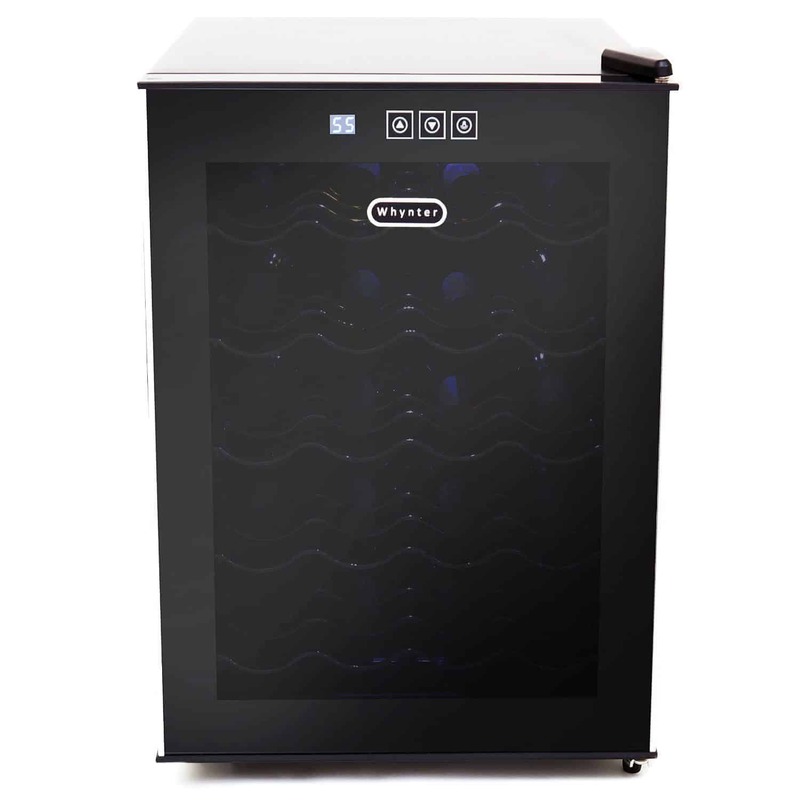 The wine cooler has dual zone temperatures, having an upper compartment designed for cooling the wines before serving or preserving white wines and a lower compartment destined to the red wines. The six full-width chrome storage shelves are removable, so if you want to store larger bottles you can easily personalize the internal space. Dual temperature zone: the upper zone has a variable temperature between 46 and 66°F and the lower zone temperatures between 54 and 66°F. Dual touch screen controls: setting the desired temperatures is easy, thanks to the dual touch screen controls. Curved door: for a more stylish design, the smoked glass door is curved. Various capacities: Haier makes five different sizes for this wine cooler, the capacities varying between six and eighteen bottles. Some users complained about the annoying noise made by the cooler’s fan. Now, based on these countertop wine cooler reviews, you should be able to choose the unit that best suits your needs. In our opinion, however, the best countertop wine cooler is the AKDY® Black Freestanding Thermoelectric Counter Dual Zone Wine Cooler. With a capacity of 12 bottles, this wine cooler has just the right size for a countertop wine cooler, in addition to being extremely versatile thanks to the dual temperature zone. A feature we really like is that both zones have the same temperature range. Thanks to this feature you will be able to either store or chill your favorite wines, the wine cooler representing a nice solution even for a wine business if you want to show a few of your best bottles to your clients. Although AKDY designed this unit for 12 standard size bottles, the removable shelves will allow you to personalize the internal space according to your needs. In this way, storing larger bottles will not be a problem. Another feature we like is the soft internal light that will allow you to admire the collection or choose your wine without having to open the door. In this way, you can avoid having your wine altered by the temperature changes. One thing to keep in mind, however, is that it is very unlikely to reach 44°F unless you locate the unit in a really cool environment. Actually, this wine cooler should be located in the coolest place of your home if you want it to maintain a good cooling capability. Nevertheless, all the features described above, together with the beautiful design of this unit, make us consider the AKDY® Black Freestanding Thermoelectric Counter Dual Zone Wine Cooler the best countertop wine cooler on the market.